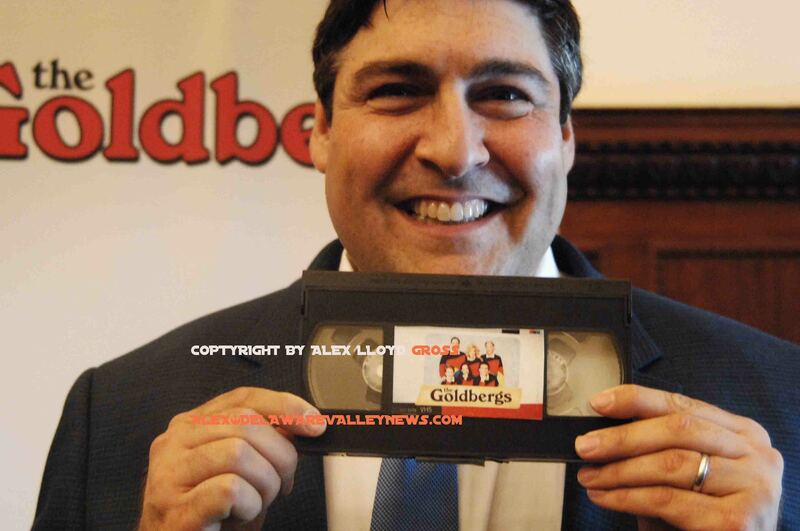 Alex Lloyd Grossphoto Delaware Valley News.com Adam Goldberg shows a VHS tape of the show. Don’t look for it in stores. Adam S. Goldberg never thought that the home videos he was shooting as a child would be the cornerstone of a television series. When his idea for a TV family in the 1980,s in Philadelphia was picked up, “I never thought it would be more than a few episodes,”he said. The show is now in it’s third season and it’s just been picked up on channel 17 locally here in the Delaware Valley. As the show referenced city landmarks, like WAWA and the Philly sports franchises, locals have taken notice. 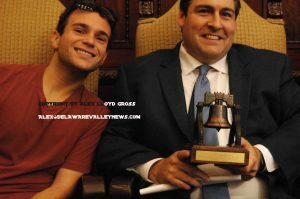 Goldberg was honored Friday during a ceremony in city hall. As representatives from the Flyers, Phillies, Eagles presented him with jerseys, WAWA was there with a gift bag. Also there, from the show was Troy Gentile, who plays Barry Goldberg on the show. He was mobbed after the ceremony by fans of the show for selfies and autographs. The show is available in DVD format but VHS tapes with the Goldberg’s logo were used as props. Goldberg only smiled and laughed when asked if the show would be coming out on VHS. Actually, when you think about it, it would make for a great collectors item. The show tries to be realistic, “We’ve built replicas of sports stadiums and even spent hundreds of thousands of dollars to recreate a mens room”, he said. Fans want accuracy and they slammed him when an episode about WAWA focused on getting beer on Sunday. He apologized again for that error. On the show, people mention real things and places. When tourists go to visit those places, they expect to see things as they are on TV. As he was honored, Ike Richman, VP of public relations for Comcast Spectaor told stories about the days when he coached him in youth ice hockey. “I’m glad you are a great writer because you would never make it as a pro hockey player”, Richman joked. The show is in it’s 100th episode and is not showing any signs of slowing down.